Two players having a game on a map is often referred to as a 1on1. A 2on2 game would be two teams of 2 players each playing as one team against the other. See also Tourney. Levels are made from a collection of 3 dimensional shapes in their rawest form. Each one of these shapes is called a brush. 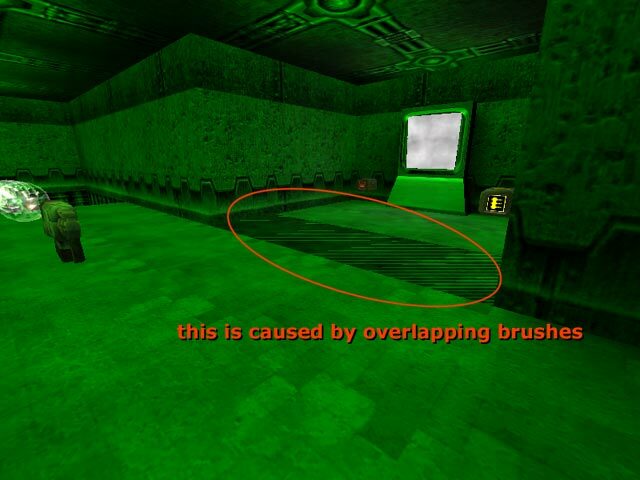 Curves within Quake3Arena are called Patches and are treated differently to a brush at all stages of development as well as by the Quake3 render engine. A team based game where the objective is to capture the other teams flag and return it to your base. Your flag is required to be home at the same time to make the capture successful. CTF stands for Capture The Flag. 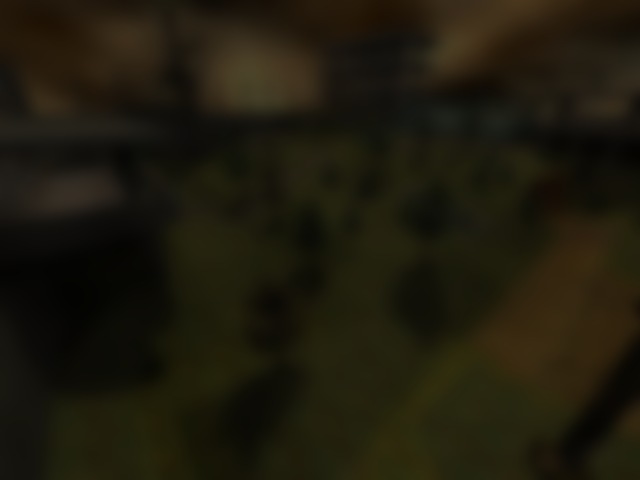 The first online game version was a mod for Quake, made by the ThreeWave team way back in 1996. The Quake mod was not the first CTF for a video game, however it was the most popular and many games after the release of the Quake CTF mod shipped with a CTF multiplayer mode as default or as part of an offical patch. A chaotic game where anything goes. It is where everyone is out to get you and you do your best to get everyone. DM stands for DeathMatch and is often called a FFA or Free For All. A term often used to describe a level that causes a low frames per second count. The cause is often related to high r_speeds. Can also be due to high memory usage on the video card or from the CPU requiring an above normal amount of processing. If you wish to check out your FPS at any time during a game type \cg_drawFPS 1 at the console. See also Laggy. A term used to describe the visual effect generated by a compile or texture error where you see a repeating, strobing image. You can see this effect in action at the bottom of some skies where the ground texture is not being drawn (some RA3 maps). Another location is on the portals under vertex lighting (try q3dm7). If a level causes the CPU to do an above average amount of processing then the frame rate may drop and the player movement will feel a little sluggish and non-responsive. This can be described as laggy. An online game may also be described as laggy when the connection to the game server is dropping packets. You can see your packet loss with the in-game netgraph, the yellow lines represent the dropped packets. A lot of the online game server run the Orange Smoothie Productions mod. This is a server side only mod that gives players and server admins a lot features. Server side only means you do not need to download anything to enjoy the benfits of the mod. If you do download the mod however you will notice a few enhanced features. All of the visual special effects in Q3A levels are based on shader scripts. These are a small series of commands that inform the Q3A render engine to perform some special function on a particular texture. A .shader file takes the place of a texture and can be a combination of textures, alpha channels and blend functions. For more information about the syntax of the scripts check out the Q3A Shader Manual. Almost the same as a DM except there are teams of players instead of individuals. The only objective is to take out the other team. An image which repeats to fill a surface without apparent seams or overlaps. A tile can be repeated in a one dimensional row for borders or vertically and horizontally to cover a surface. The majority of textures in games are tiled, it really cuts down on the file size and video memory if most of your textures are small tiles repeated. A Tourney (or Dual) game is often a more serious match between 2 players. The term is derived from the word tournament. It is where a player can show off just how good their skills and map knowledge are. Tourney games are not restricted to 2 players but more than 1 player per side is really a team game. If a face from two brushes are on the same plane the texturing can double up and appear to flicker when you move. This is commonly called zebraing. Not all video cards and set-ups will show zebraing but for the ones that do zebraing stands out like a sore thumb. Zebraing in the flesh - a screen shot of what zebaring looks like.